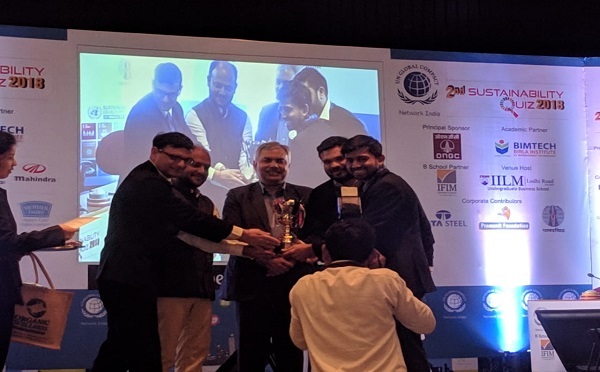 Proud to announce Teri sas team led by Amitav Mandal and samarth Arora stood runner up for 2nd Sustainability Quiz organised by UN global compact. Congratulations to the winners! On Tuesday, May 9th, the Sustainable Purchasing Leadership Council (SPLC), based at Washington, DC, recognized ten organizations and one individual for their leadership in the sustainable purchasing movement, a growing trend in which organizations are using their purchasing power to advance the long term health and vitality of society, economies, and the planet. 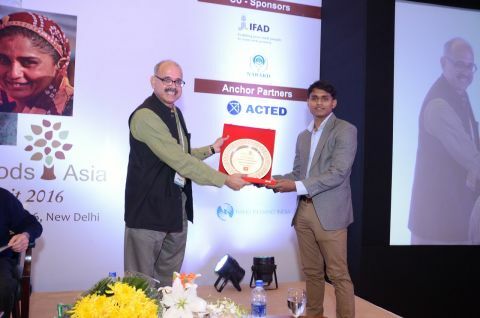 The individual award was presented to Mr.Sanjay Kumar(TERI SAS alumnus - MA(PP&SD) Class of 2008 ), who currently serves as the Additional General Manager, Dedicated Freight Corridors Corporation of India limited (DFCCIL), Ministry of Railways, Government of India. The award announcement states: "Over a decade of tireless work at the national transport provider of India, Sanjay’s vision, leadership, and dedicated effort have been fundamental to the growth of the sustainable purchasing movement within his 20 billion dollar national railway company. His work has reduced Indian Railway’s carbon footprint by 1.5 million tons of CO2eq and saved over $9 million per year. Through active collaboration with international entities, Sanjay has become a recognized advocate for sustainable procurement on the global stage. Harsh Jaiswal, student of MA-SDP 3rd semester secured third position in the Sitaram Rao Livelihoods Asia Case Study Competition 2016. The title of his case study was 'Sustainable Agriculture - A New Partnership Paradigm in Dantewada'. Ms Florencia, a student of M.Sc. (Geoinformatics, 2013-15 batch) and former SCCF scholar, received Nepal Bidya Bhusan Medal on World Literacy Day by President of Nepal, Ms. Bidya Bhandari in recognition of achieving gold medal for topping MSc Geoinformatics program from TERI University.This medal is awarded annually to students who top their respective academic programs from Bachelors to PhD. TERI University students win best project award at "Eco Homes Building Design Competition"
Eco nirmitee - A student led startup initiative from TERI University recently won the Best project award at "Eco Homes Building Design Competition" organized by International Youth Society for Energy and Renewable Technology (IYSERT) in association with Great Lakes Institute of Management for their project "Sustainable transformation of construction waste into rapid affordable housing and infrastructure for deprived sections of society". The competition had 8 Finalist from South Asia presenting design and technology solutions for construction of eco homes. The winning team of TERI University students has been awarded a consulting contract with IYSERT for Design and Development of eco homes. As a part of the recognition, the team will also have an opportunity to work with London School of Economics- Energy Society on the theme of 'design of sustainable cities'. The TU students' project aims to address the concerns of construction industry by integrating sustainability principles into design and material. An industrial symbiosis approach is adopted in the project conceptualization focusing on sharing and transformation of construction waste into resource. The virgin material required for housing in vicinity of construction sites can be replaced by recycled and processed waste thereby reducing the GHG emissions also. An interdisciplinary project team comprises of students from M Tech Urban Development & Management, MBA Business Sustainability and MBA Infrastructure under the mentorship of Dr Shaleen Singhal, Dr Suresh Jain and Dr Kaushik Bandyopadhay of TERI University. The start-up initiative team comprises of Rohit Sadaphal (Execution and Product Innovation), Sahil Verma (Marketing), Diksha Sharma (Sustainability), Sanju Vargheese (Finance & Accounts), Upasana Bisht (Supply Chain and Operations) and Nandan Kumar (Business Development & Strategy). 'Energy forum', a flagship event at Rajiv Gandhi Institute of Petroleum Technology's fest 'Oil Spring' organized by its Department of Management Studies was held on the 1st of February, 2014 at the Institute's New Delhi Campus. Two students from M.B.A. Business Sustainability, 2nd semester were shortlisted for the final round of idea presentation and open discussion on the theme 'Sustainability through Conservation'. One of the students, Ananya Khosla, secured the first place in the event, having competed with students from IIM Lucknow and IIT Kharagpur, among others. Her paper was based on achieving conservation of energy by facilitation of renewable energy and phasing out of dependency on fossil fuels by governments and corporates alike. The students gained much from the expertise provided by the judges who rigorously questioned the participants and provided practical insight to their proposed ideas. The Business & Community Foundation held its 3rd annual debate in partnership with Indian Institute of Corporate Affairs, supported by GIZ at the India International Center Annexe in New Delhi on the 24th of January, 2014. This debate was aimed at discussing the importance of National Voluntary Guidelines and their role in promoting responsibility and accountability among Indian businesses. Nine students from 2nd Semester MBA (Business Sustainability) and MBA (Infrastructure) attended this debate as speakers and audience, eager to interact on this issue with students from the likes of IIFT and JMC, among others. The teams lead by Amrita Bhakta Vohra, spoke for the motion and secured the first position in their category. TERI U students also discussed the issue with eminent jurists, Shefali Chaturvedi of CII , author Pushpa Sundar, Raj Kachroo of the Aman trust and leadership guru Ravi Chaudhary, gaining much from the interaction and from the opportunity to discourse with students from different institutes on this pertinent matter. A team from Department of Natural Resources, TERI University (Ms Deepika Mann, Ms Bakul Budhiraja, and Ms Florencia M Tuladhar) receiving the award for GIS Quiz competition in the 14th ESRI India User Conference, 11-12 December, 2013 at New Delhi. Mr Abdulhakim Ahmed, a student of M.Sc. (Geoinformatics, 2013-14 batch), Department of Natural Resources received Best Oral Presentation Award in the 14th ESRI India User Conference, 11-12 December, 2013 at New Delhi. He presented a work on "GIS and remote sensing integrated for malaria risk mapping, the case of Kersa district, Ethiopia". Rohit Sadaphal, a student of the M Tech Urban Development and Management programme has won award for his notable submission at the competition aimed to recognise the most innovative minds across India. Rohit's innovation was titled as 'Sustainable transformation of Construction Waste into housing products for underprivileged people'. The competition received 51000 registrations of which 4400 entries from over 300 colleges in across India got validated and shortlisted for final submissions. Out of the top 10 entries, Rohit's submission was selected for the Jury's Choice Award by eminent jury members. Rohit Sadaphal's innovation prototype titled as 'Made in India - Ecocrete', demonstrates sustainable solutions by transforming construction waste into structural elements for cost effective housing for under privileged community in urban and rural areas. Commending Rohit's achievement, Dr. Shaleen Singhal mentioned that his submission marks a contribution to sustainability concerns in construction industry and the recognition of his innovation shall advance the debate on sustainability issues within the wider built environment and urban development sector. The paper titled 'Possible interventions and challenges related to control of water table depletion in Vasant Kunj and Masoodpur, New Delhi' from TERI University has been selected as one of the top entries of Earthian 2013. The winning entry is from Vinay K. Singh, Sumit Vij, Ninika Dhawan and Rumbidzai Faith Masawi, M.A. (SDP) students (Department of Policy Studies). The contest received 700 submissions from colleges and 500 submissions from schools. The Earthian awards function is scheduled for February 2013. Ms Monica Saini, a student of PhD (Natural Resource Management) received Best Poster Presentation Award in the National Symposium on 'Space Technology for Food & Environmental Security' & Annual Convention of Indian Society of Remote Sensing & Indian Society of Geomatics held at New Delhi during 5-7 December 2012 at Indian Agricultural Research Institute, New Delhi. She presented part of her Ph.D. work on "A quantitative analysis bio-physical and livelihood profiles of Kanva watershed - a case study of watershed management in southern Karnataka, India". The poster is co-authored by P. K. Joshi, M.N. Reddy and M. Sekhar. Prof. P K Joshi received the award on her behalf. Ms Anusheema Chakraborty, a student of M.Sc. (Environmental Studies, 2012 batch) received Best Oral Presentation Award in the 13th ESRI India User Conference, 5-6 December, 2012 at Noida. She presented her M.Sc. thesis work on "Mapping biomes of India using Holdridge lifezone model - identifying footprints of climate change". The paper is co-authored by Annirudhha Gosh, P K Joshi and G Areendran. On 27 January 2012, TERI University was awarded with the 'Most Innovative Curriculum' award at the India Today Aspire Education Summit Awards 2012 and stood tall among the best of India's education sector who were honoured at this prestigious summit. 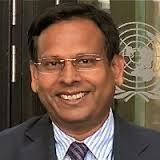 Prof Prateek Sharma, Dean, Faculty of Applied Science, received the award on behalf of TERI University. Our award for the 'Most Innovative Curriculum' is for incorporating elements in education that are the need of the hour by understanding and adapting to change. Prof.Yuji Suzuki, Organising Committee Chair giving the award to Fawzia Tarannum. For the second year in a row, a PhD student from the TERI University, Ms Fawzia Tarannum, was declared the winner of the 3-minute thesis competition, at the 2011 ProSPER.Net Young Researchers' School (YSR). Last year too, a TERI University student, Ms Shivakshi had won the competition. The Young Researchers' School offers opportunities for students to be exposed to sustainability issues, while developing research skills, and to further encourage a network of students/future professionals and academics working on sustainable development. This year, the programmed was jointly hosted by Hosei University, Tokyo and the United Nations University's Institute of Advanced Studies, from 1 to 12 August 2011. The theme for this year was "Learning from Japan's experiences on urban sustainability". Two students from TERI University joined 15 PhD students from the Asia-Pacific region participated in the programme this year. The programme gave an insight into various aspects of urban sustainability through lectures and field trips to places like Machida Recycling Cultural Center and Urban Design Center, Kashiwa. The programme provided an excellent platform for participants to network with other students and resource persons working in the field of urban sustainability. It also gave an opportunity to young researchers to develop research proposals and sharpen their communication skills through various activities. Three young Indian agri scientists have received Monsanto Beachell-Borlaug International Scholars Program (MBBISP) Research Fellowships in 2010 for improving rice and wheat breeding among the second set of 14 recipients The MBBISP 2010 recipients' projects include enhancing resistance to aphids in wheat ; breeding rice for cold tolerance in Brazil and improving drought tolerance in wheat Among the Indian winners, Anuradha Bansal holds a Masters in plant biotechnology from The Energy and Resources Institute (TERI) University; Each winner has developed a next generation breeding research project in wheat - Anuradha and Amandeep aim to address plant resistance to leaf rust, and Luxmi's molecular breeding is aimed towards developing grain protein and micronutrient. Anuradha, Amandeep and Luxmi will collaborate with the International Maize and Wheat Improvement Centre (CIMMYT), Mexico; University of Zurich, Switzerland; and University of California, Davis respectively. Biotechnology research work at the TERI University, summarized in the form of a Poster, has won the 3rd prize under the theme "Walkway of Discovery", at the Bangalore India BIO 2010 meet.